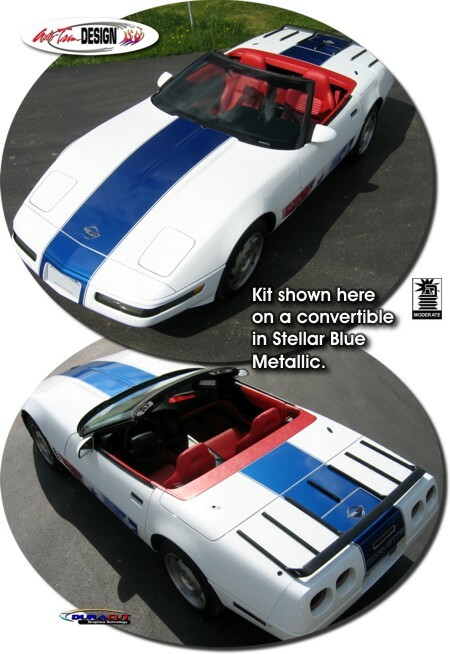 Make your '84-'96 Chevrolet Corvette C4 "Tough-looking" with this unique Rally Stripe Graphics kit. Reminiscent of the 1996 "Grand Sport" stripe, kit is PRECUT and ready to install in a wide variety of colors - with NO TRIMMING required! This stripe package is not just a set of straight vinyl strips in a box. As shown in the image, our graphic kit consists of precut, prefitted and contoured pieces. This kit specifically fits the '84-'96 Chevrolet Corvette C4 as shown in the Graphic Fitment chart below and will not fit any other vehicle. Graphic kit is provided with general online application and care instructions. Trimmable one (1) piece Spoiler Kit (ATD-CHVCRVTGRPH100) consists of one (1) 16" (40.64cm) long precut piece (outer pinstripes included) that can be hand trimmed for most after-market spoiler applications. Due to the curvature of the Hood, Roof and Rear Bumper areas, we recommend certain "hinge" points as shown on the associated Product Part Lists. Upper Third Brake Light found on '86-'90 Coupes and all ZR-1 models require temporary removal for successful application of the Roof Rear piece. Slight trimming may be required for associated wiring and panel holes.